The annual audit report of the Chandigarh Municipal Corporation rapped the tax branch of the civic body for its failure to maintain records of the property tax collections. Twenty-two persons, including four fire-fighters, were rushed to the GMSH-16 today after they fell unconscious due to chlorine gas leak. 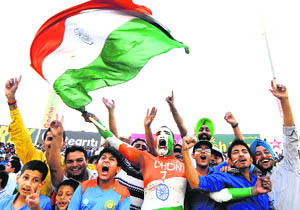 In a city like Chandigarh, c of cricket stands for chaos. Organising international events has never been an easy process here. Traffic went haywire on the third ODI between India and Australia. NRI Taranjeet Singh’s entry set the pace for the first open auction of the vanity numbers by the Registration and Licensing Authority today. The vanity number 0001 of the CH01 AV series fetched the RLA Rs 7.01 lakh. Spying on his wife proved costly to a Mohali resident. The Chandigarh Police arrested Dr Gyaneshwar Maini for installing a global positioning system (GPS) and a microphone on his wife’s car without her knowledge. He used to track his wife’s location and listen to the conversation going on in the car. The couple, both doctors, had estranged relationship. The accused runs a clinic in Sector 55 and the complainant works at a private hospital in Mohali. The district health officer (DHO), Mohali, has allowed the food safety officer to initiate legal action against the management of Barbeque Nation, Phase V, which offered food that was “unfit for human consumption”. The UT Food and Supplies and Consumer Affairs Department has invited objections from the public to the National Food Security Act. These objections are to be submitted by the first week of next month. Decking up for Karwa Chauth will burn a hole in your pockets this season. For applying henna that cost Rs 600 as the highest last season, you will have to shell out Rs 1,150 this time. The UT District Consumer Disputes Redressal Forum today slapped a fine of Rs 10,000 to Northern Railways which would be paid as compensation for the harassment and agony caused to a complainant, who is a senior citizen and a resident of Panchkula. The court further ordered to pay Rs 5,000 as litigation expenses to the complainant. To clear the heavy rush due to Chatt Pooja and Diwali, the Northern Railways is going to start a special weekly train to ferry passengers between Nangal Dam and Jaipur. On its way, the train will halt at various stations, including Chandigarh. A daylong conference on woman empowerment at Government Medical College and Hospital, Sector 32, discussed at length various aspects of crime against woman. 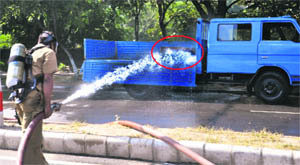 A ambulance of the Alchemist Hospital, Sector 21, caught fire near the Tau Devi Lal Stadium, Sector 5, Panchkula, in which a nurse suffered minor burn injuries, while the driver and an attendant escaped without any injuries. An international conference, Advances in Water Resources: Development and Management (AWRDM - 2013), will be organised by Panjab University at centre of advance study in geology from October 23 to 26. Chandigarh: A blood donation camp was organised by Sacred Heart School, Sector 26, Chandigarh, on Saturday. As many as 150 units of blood were collected. A 188-time blood donor, Charanjit Singh, was the special invitee on the occasion. Dr RR Sharma and Dr Dhawan from the blood transfusion medicine department, PGI, supervised the camp. Farmers, who have been sitting in the grain market to sell their paddy for the past many days, and the labourers had to face great difficulty as the commission agents of Bassi Pathana boycotted the procurement of paddy process and announced to observe indefinite strike against the pick and choose and dictatorial attitude of the officials of all the government procurement agencies. The city police has arrested two youths who used to steal motorcycles and cars for taking joyrides and then abandoned the vehicles after emptying the fuel tanks. Two cars and six two-wheelers have also been recovered from the accused. The Chandigarh police has arrested KK Malhohtra, the complainant in the infamous DSP Raka Gira case, for allegedly refusing to return an Innova borrowed from a taxi operator. 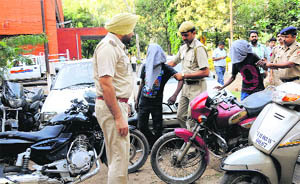 The Mohali police today arrested a woman and her brother-in-law for assaulting the manager of the Phase VI branch of the Oriental Bank of Commerce. A 27-year-old person was forcibly taken away in a car by some unknown persons, who also beat him up first at his rented accommodation at Phase IV, here tonight. The incident occurred around 10 pm, said the police. 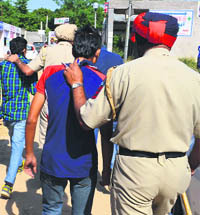 The police has booked a Yamunanagar resident on the charge of impersonating. The accused, Sangeeta, was taking Trained Graduate Teacher (TGT) exam for someone else at a private school in Sector 16, when she was nabbed on June 26. All eyes were on Yuvraj as he was on strike. His dismissal on the first ball came in as a disappointment. He fell to Mitchell Johnson. Cricket buffs were hoping fireworks from the local lad. His 35-ball 77 knock in T20 against Australia on October 10 had heralded his comeback. Jalandhar-based Ajay Singh Mann, who was accompanied by his three friends, Rajinder Singh, Deepak and Sukpreet Singh, said they had not expected a poor show from Yuvi. Panchkula resident Tamanna and her friend Divya said, "We wanted to see him hit sixes and boundaries. Black-marketeers made most of the third ODI today. A number of people were seen selling tickets on the black market at Phase IX near the PCA stadium. On the second day of the ongoing CBSE North Zone-I Tae kwon do Championship, Bhawandeep Batth of Stepping Stone School, Chandigarh, and Abhishay Rawat of AKSIPS School, Chandigarh, won a bronze medal each. 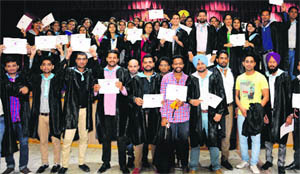 Guru Nanak Dev University, Amritsar, blanked SRTM University, Nanded, 11-0, on the first day of the All India Inter-University Baseball for Men. In the second match, JNT University, Hyderabad, beat Charan Singh University, Meerut, 14-4.